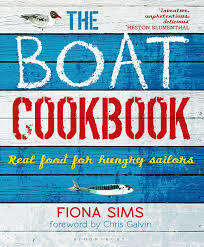 We have a copy of The Boat Cook Book by Fiona Sims to give away this week. All you have to do is like our Facebook page (our actual page not a post). We will then pick a winner randomly from the page likes. You have until October 12th 2018 to like our page. You don’t have to be a member of Lovesail to participate. The Boat Cook Book, real food for hungry sailors – For anyone with a tiny galley kitchen, there’s good news: no more bland leftovers aboard. These delicious and easy recipes, all made with minimum fuss and maximum flavour, will allow you to spoil yourself in harbour and keep things simple at sea – not to mention rustle up a mean rum punch. With handy ideas on setting up the galley, a lazy guide to filleting mackerel and tips for hosting the perfect beach barbecue, this is the must-have guide for sailors and seaside-lovers alike. Creative Cuisine is possible on a long voyage. Julian Kimberley Sailing Today Magazine’s cookery author and joint owner of GN Espace (pictured left above) is completing in this years ARC race on board Casamara, a Discovery 55. We in the Lovesail office are very lucky to know Julian and he has agreed to send us updates from the race for our blog and about the creative cuisine he will be creating. Julian will be providing fresh meals made from fresh ingredients for the six hungry crew, throughout the duration of the crossing. A sample menu for the crew of Casamara includes: Breakfast; Eggs, bacon, sausage, tomato, beans and toast. Lunch; Tomato, mozzarella, avocado with fresh bread and cheese. Dinner; beef in guiness, with garlic potato followed by fresh lemon cheesecake with blackberries and ice cream. Despite the temperatures expected in the latitudes that they will be sailing in, this is all made possible by using some of the specialist vacuum storage equipment supplied by his own company GN Espace Galley Solutions Ltd, whose innovative designs and equipment are now seen as the benchmark for the galleys of modern cruising yachts. Said Julian “We are essentially highlighting that good, healthy and nutrious food can be made on board using our equipment which makes it more easy to to store, prepare and cook no matter where you are sailing”. If you would like to follow Casamara’s progress during the ARC Race and their creative cuisine, the World Cruising website has a Fleet Viewer where you see each yacht’s position and also their statistics. And don’t forget to keep checking the Lovesail news blog for Julian’s updates. 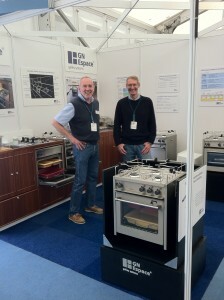 Image: Southampton Boat Show 2011, GN Espace trade stand.